Subscribe to the Kalamazoo Industries youtube channel and click the notification bell to be alerted when we upload new video’s. 2FS72/2FS72M 2 x 72 inch multi position belt grinder is offered as a v-driven unit and or direct drive unit. 2FS72M belt grinder travels 7200 SFPM to remove metal quickly with minimal heat buildup. The 2FS72 2” x 72” was designed to use your own motor. Both of these grinders were designed to meet a customer’s grinding needs and now is a part of our standard belt grinding equipment. 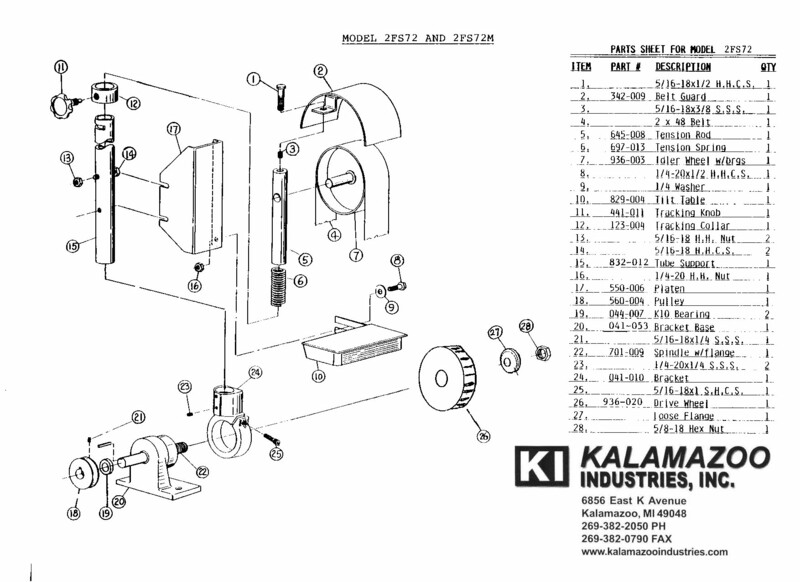 The Kalamazoo Industries model 2FS72/2FS72M 2” x 72” multi position belt grinder features a 8” x 2” serrated 70 duro contact wheel, 1/2HP 1PH 110V motor or a v-belt pulley, removable work table and platen. Great for grinding both ferrous and non-ferrous materials quickly with minimal heat build up. 2FS72/2FS72M abrasive belt grinder is sold with or without a motor. GREAT for knife making / hollow grinding and blade sharpening! Replaceable no matter what the age of the belt grinder is. Replacing parts from this machine is quick and easy. Other forms of the 2″ x 72″ belt will work with this unit. 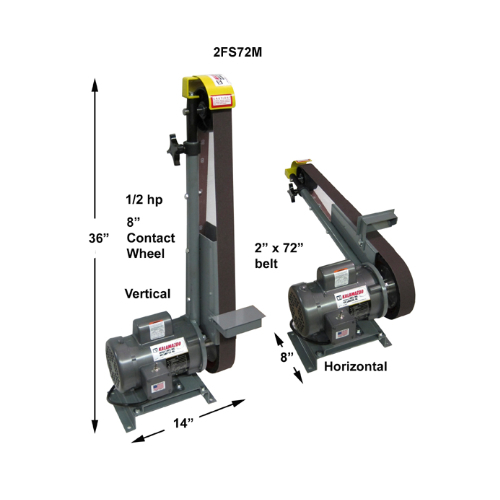 2FS72 -Less Motor, multi-position v-belt driven belt grinder. 2FS72M – 1/2Hp 1PH 110V motor, multi-position belt grinder. Put your spare motors to work. Any 1/2 HP to 1 HP 3450, rpm motor will work. Mount to your bench, fixture and or tool post. One knob tracking, sanding belt is spring tensioned . Similar to the 2FS only 2″ x 72″ belt and 8″ serrated contact wheel. Great for knife makers and blade sharpeners. Great for wood wood working (with the correct belt). Model: 2FS72M, direct drive unit with a 1/2 HP , 110 volt motor and base. This belt grinder has applications in the following industries: Energy, Oil/Natural Gas, Petro/Chemical, Knife Manufacturing, Automotive, Metal Foundries, as well as many other Manufacturing and Fabrication environments.